​​Rep. 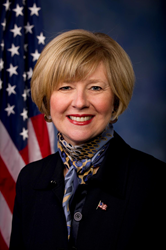 Susan Brooks, co-chair of the Congressional School Safety Caucus, to speak on school security initiatives. The Security Industry Association (SIA), in cooperation with the Congressional School Safety Caucus, will host a critically important panel discussion on "Securing America's K-12 Schools" at the U.S. Capitol Visitors Center, HVC-201, at 12 p.m. ET on June 28 during its SIA GovSummit public policy conference. Prior to the panel discussion, Rep. Susan Brooks, R-Ind., and other members will provide an update on the Congressional School Safety Caucus, and efforts to bolster federal grant funding for school security initiatives. During the panel, experts will focus on how two communities impacted by tragic loss are addressing the need to improve school security, creating steps for other states to follow. "This school security panel will bring together subject matters experts to assess solutions to protect children from active shooters and other threats," said Jake Parker, SIA Director of Government Relations. "In addition to discussions about how to address these security challenges from all sides of the problem, Indiana state officials and a public-school system in Colorado will share their specific success stories of how they have produced results in making their school facilities safer." Robert Quinn of the Indiana Department of Homeland Security and David Woodward of the Indiana Department of Education. Indiana state officials will present the proactive steps that Indiana is taking to improve school security and safety as well as how it could serve as a model for other states. In 2016, the Indiana Legislature passed legislation directing the establishment and maintenance of guidelines for school emergency response systems in conjunction with experts from the division of school building physical security and safety. Robert Boyd, Executive Director of the Secure Schools Alliance. The Alliance is taking a leadership role in launching a national conversation about the issue of school safety and advocating a course of action for addressing it. Chaired by Reps. Brooks and Rick Larsen, D-Wash., the Congressional School Safety Caucus is dedicated to bringing together education, law enforcement, government and private sector leaders to discuss how to improve safety and security at our nation's schools. To attend as registered press, contact Mickey McCarter, SIA communications manager, at mmccarter@securityindustry.org or 301-804-4704. Lunch is provided! For more information on SIA GovSummit, visit http://www.securityindustry.org/summit. Qualified reporters are eligible to attend the entire event for media coverage. To register as press, contact Mickey McCarter, SIA communications manager, at mmccarter(at)securityindustry.org.